As you can see, my old umbrella is completely held together by safety pins and paper clips. Every single junction of stretcher and rib has broken at one time or another, which I’ve always managed to repair with whatever little doodad connectors I could lay my hands on quickly. Although I’ve bought many other, much nicer umbrellas over the years, they’ve all broken in ways that couldn’t be so easily fixed. Which is why, twenty years later, I’m still carrying around this raggedy contraption. It’s usually the only one in working order when the forecast calls for rain. It’s imperfect, but then again, “perfect” never seems to stick around for long. 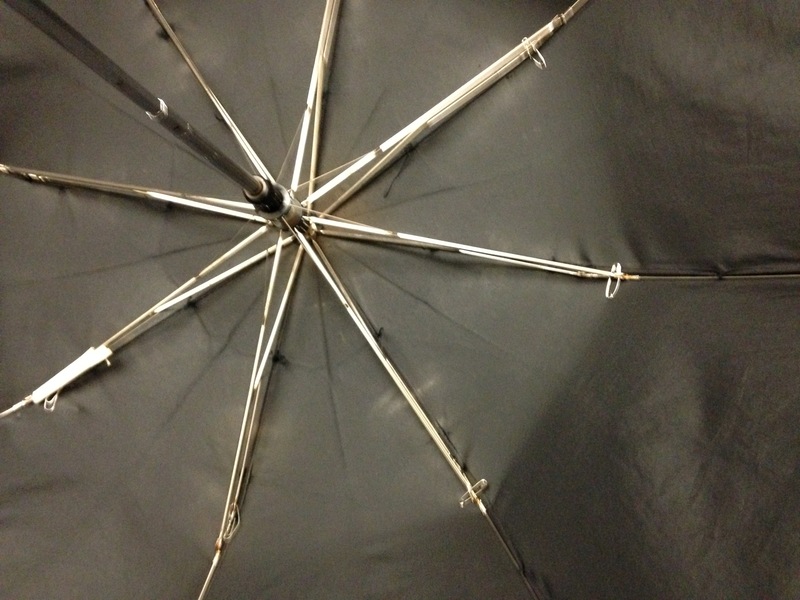 This entry was posted in Life and tagged broken umbrella, imper, perfection, umbrella repair. Bookmark the permalink. Twenty years of faithful service is worth way more than perfection. Great shot! You’re so right! That’s a point worth remembering beyond the literal saga of my trusty umbrella. Ingenious system of pins and clips! I’m always disappointed when things break and can’t be fixed. Funny which items are well used and become imperfect, but can still be used years (decades!) later. And those are the items we become fond of, despite (or maybe because of?) their imperfections? used to so they would get more bang for their buck. I’m a fixer, for sure. But sometimes I have to stop and think: what is it costing me to repair this versus what would it cost to replace it? The replacement is usually nowhere near the original in terms of quality, though. Funny, because I’d pay more in order to get quality. But the manufacturers seem to be in it for the cheap purchase only. You can’t find quality at any price. That is an amazing picture, too!! Thanks! You can sure see the holes and long threadbare lines where the fabric has worn away. So far I’ve not gotten dripped all over, but the day may come when my umbrella is nothing more than a sieve. That will be one SAD day!!!! I love this. I have a couple stories of repairs that have lasted the years. I’m a fixer first also, but having someone else do it often costs almost as much as a new one. We once bought a used Maytag dryer. It was 1994, and the dryer had been manufactured in 1950 and then refurbished. It was $50, and we were in grad school, so we took it. We used it for 10 years at 4 different homes, and it dutifully performed. Then it needed a belt replaced or so we thought. Turned out to be something else, and the part was no longer made. We were so sad to see it go with its simple dials and excellent drying. We replaced it and then replaced it again when the newer washer failed, and we went with high efficiency….not a good choice. We got a new washer and dryer when we moved to the condo last year, leaving the HE ones for the next owners. So three new ones in the last 12 years. How we miss that old Maytag! Maytag, huh? I remember their lonely repairman ads, and hearing your story, I have to believe there was a lot truth in their quality claims! I miss simple, built-to-last appliances.